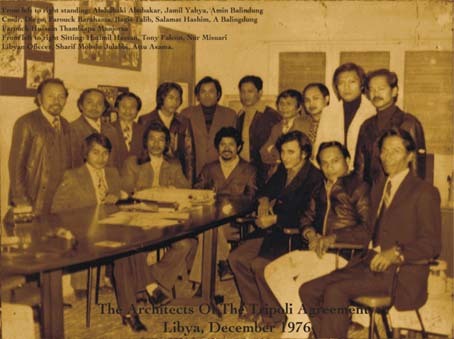 MNLF leading piooneers in the Bangsamoro Freedom Struggle to regain national self-deternibation and independence form Philippine Colonialism: Chairman of the Moro National Liberation Front (MNLF) Prof. Nur Misuari is shown in photo (sitting in center) with the pioneering officers and members of the MNLF Central Committee, including Dimas Pundato, MNLF Vice-Chaiman; Ustaj Salamat Hashim, MNLF Foreign Minister; Ustaj Abdulbaki Abubakar, MNLF Foreign Affairs Secretary General; Dr. Parouk Hussin, MNLF Deputy Foreign Minister; Dr. Tham Manjoorsa, MNLF National Intelligence Officer; Abdurasad Asani, MNLF Information Chairman; Ustaj Abdulmuin Kissaei, MNLF Libya Office Director, Ustaj Sharief Moksin Julabbi and other prominent MNLF leaders. Photo courtesy of Sharief Julabbi. From March 18, 1968 today, covering forty four (44) years, the heinous Jabidah massacre of hundreds Bangsamoro Tausug youth trainees took place in Corregidor Island perpetrated by the Armed Forces of the Philippines (AFP) soldiers. The globally-known day of infamy also inspired the historical birth of the Moro National Liberation Front (MNLF) to start launching the freedom struggle of the oppressed Bangsamoro people of Mindanao against Philippine colonialism under the murderous regime of Dictator Ferdinand E. Marcos. Significantly, March 18 has been annually celebrated Bangsamoro Freedom Day, marking the official proclamation of the struggle for independence and self-determination of the Bangsamoro people under Philippine colonialism in 1968.
bloody hostilities between the different distinct communities – Christian Filipinos and Moros. The prophecy foretold has now resulted in the more than four decades Filipino-Moro war in Mindanao, registering already more than 200,000 deaths and countless material losses for the Muslim and Highlander natives as well as Christian settlers in the war-torn region. For more than forty years now, the celebration of March 18 as Bangsamoro Freedom Day has served a rallying point for the oppressed and colonized natives of Mindanao, Sulu and Palawan to emancipate themselves from Philippine colonialism that was immorally and illegally installed by the American government only in July 4, 1946. It is recalled that the Bangsamoro Sultanate government of MINSUPALA started around 1450 with the establishment of the Sultanate of Sulu, which later on expanded to Sultanate of Sulu and North Borneo (now Sabah). The establishment of the Sultanate government was years later followed by the Sultanate of Maguindanao and Sultanate of Buayan in Cotabato and the Sultanate apat na pangampong principalities in Lanao. Historically, the Mindanao Sultanate governments were recognized by China, Great Britain, Netherlands and the United States of America, enjoying peaceful diplomatic and commercial ties with the foreign countries and also signing international treaties with them. On the other hand, it is also recorded in history that the Bangsamoro Sultanate governments had to fight long years of bitterest series of wars with the piratical Spanish invaders, who were bent on Christianizing and colonizing Mindanao and satellite islands. The century-long imposed war on the Bangsamoro people by the Spaniards was later on pursued by the American marauders for almost forty five years, Japanese invaders for almost five years and contemporaneously by the Filipino colonizers for more than forty years. Without a comprehensive solution to achieve ‘just and lasting’ peace, the current Filipino-Moro war in Mindanao is not about to end. Nonetheless, although now engage in both unfinished peace parley and war footing with the Filipino colonizers, the Bangsamoro freedom fighters everywhere in Mindanao and Bangsamoro people throughout the world have thus taken pride to befittingly commemorate Bangsamoro Freedom Day every March 18 of the MNLF Anniversary celebration.